On the first or second day when I decided that I would be working on a sidewalk sweeper, I thought of a couple different possibilities. The unkemptness of the streets is both an eyesore, a potential health risk, and an environmental problem if trash ends up in the sewer system. After settling on the problem of cleaning the streets, I thought about how to improve the streetsweeper itself to clean the sidewalks. I envisioned a crane that could waterjet or brush the sidewalk, but I quickly saw that making any addition to the street sweepers would not work, as there are cars, people, and poles in the way. As such, this sidewalk-sweeper had to be its own unit. I first thought of the possibility of waterjets, a single tumbler that lifts trash up into a container, or even just making a smaller version of current sweepers, but these ideas had there own drawbacks and annoyances over this design. The waterjet designs, although compelling due to their effective cleaning and speed capabilities, need a constant and significant amount of water, and there would be no real way to make such a device portable enough to be a separate unit from the streetsweeper. I decided to take inspiration from the current sweepers, and I researched a bit about the them. I saw an inefficiency in having only one or two brushes to clean, and the need to also drive wheels as well as the brushes, but a very good capability for picking up trash and cleaning the roads. I decided then, on an autonomous street sweeping robot that uses brushes for both cleaning and locomotion. I figured out that tilting the brushes would allow only one side of the wheel to have traction, allowing for controlled motions. I knew that one high torque motor is better in both efficiency and cost than four separate motors, and so the StreetS needed to use only one motor to drive all four brushes. The mechanism must also allow the brushes to tilt using as few parts and electronics as possible, for cost and efficiency. I drew some plans on paper and played around with the idea of having different gear ratios between the input and output. Then, I started modeling the StreetS in Fusion 360, a Computer Aided Design (CAD) software. While I was working on the CAD design, I realized that a single actuator could be made to control both brushes on the same side, which cuts down on cost and energy consumption. The problem was that when I implemented this in the design, I connected the actuators to the wrong brushes, and ended up with a vehicle capable of going forward and backward, but never able to turn. 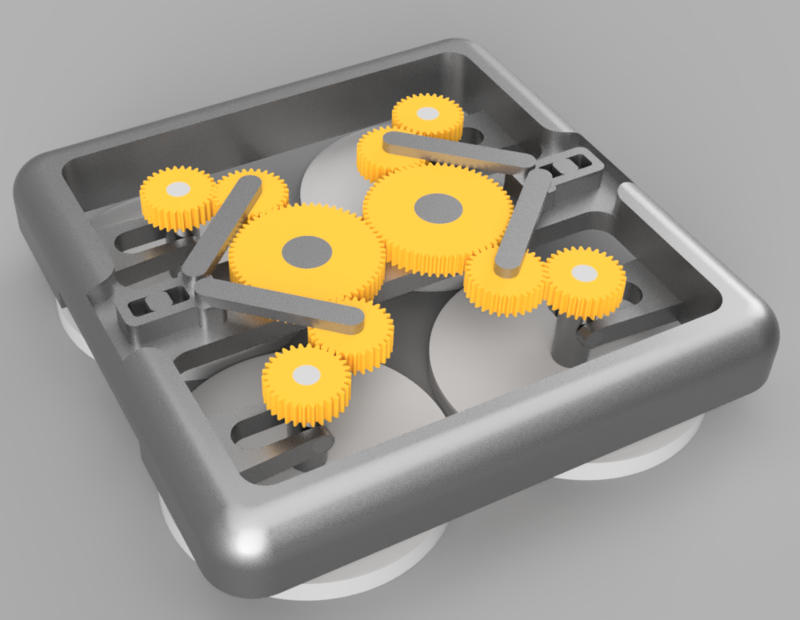 In remedying this, I changed up the design of the chassis a bit to fit the new sliding mechanisms, and to stop the sliders from rotating as well as sliding. The resulting vehicle is driven by the brushes, and is almost exactly what I envisioned. The larger plan would be to have a top plate on this vehicle which would hold the motor, a skirt would be placed around the brushes that hold metal wire bristles, and the sliders would be replaced with worm gear linear actuators. This vehicle would have a decently sized battery, and would be able to mount to the side of a street sweeper to charge and deploy. The sanitation worker would only have to turn it on and it would navigate along the sidewalk, buffing the gum and grime off the street, while also pushing trash into the gutter for pickup by the street sweeper. I would imagine that the system would use a Light Detection and Ranging (LIDAR) sensor, a gutter spotting camera, and a GPS module to navigate around the streets safely. In this way, the streets would get a scrub, trash could be collected, and the world would get a prettier and healthier New York City without overhauling the street sweeper or how sidewalks work.